For those of you who don't know I spend a lot of time in the kitchen. Over the years I've developed a lot of personal recipes, including a mean garlic butter seared salmon with Dijon mayonnaise that I like to make for my wife. I'm also in the process of picking up peppers to grow for my future hot sauce idea. I've met a lot of fellow chef Dtoiders since I've been here, so whenever I see a gaming related cooking opportunity I jumped on it. Having really enjoyed the official World of Warcraft cookbook I was eager to try out the Elder Scrolls joint from the same author. It was definitely worth my time. 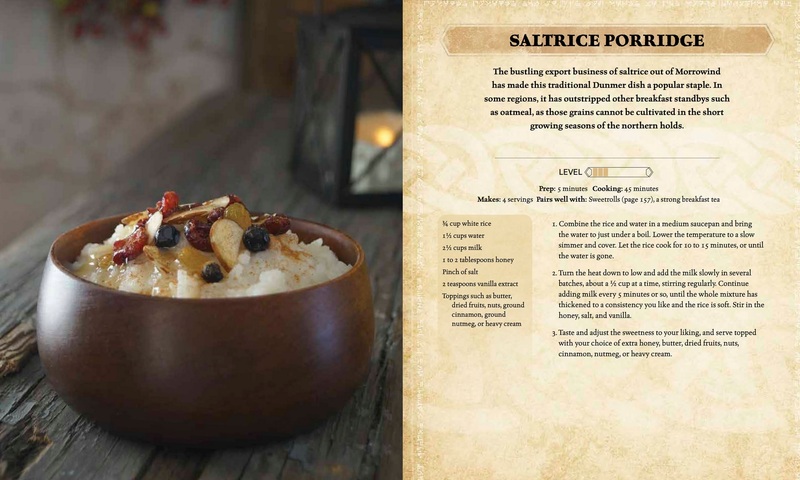 Chelsea Monroe-Cassel, who has worked on several high-profile cookbooks (Blizzard and Game of Thrones related) returns for The Elder Scrolls: The Official Cookbook from Insight Editions and I have to say it was the right choice. I love the little details like the flavor text/fluff before a recipe, showcasing a little factoid from the series or a bit of in-house lore to help justify the recipe's inclusion. If you love cooking you'll know it can be one of the most rewarding activities in life, so these little smile-worthy moments enhance the text. Monroe-Cassel is able to justify the use of the IP with a meaty intro that weaves in personal experience with the craft of cooking and the Elder Scrolls universe at large, coupled with a rather large breakdown of each major race of Tamriel and their tastes in food. The full scale map of Tamriel is the cherry on top (that'll be my only food metaphor, I promise) and a great way to follow along as you're whipping up recipes from various regions. Obligatory inclusions like a [mud]crab dip, sweetrolls, Skooma and mead/wine-based concoctions make it in. As is the case with Monroe-Cassel's other work, there's also room for dietary considerations (vegetarian, vegan, gluten-free) with a key at the end of the book and wiggle-room with individual recipes for substitutions. Just know that with the high fantasy angle the Elder Scrolls cookbook is heavier on the meat than a lot of other similar titles. 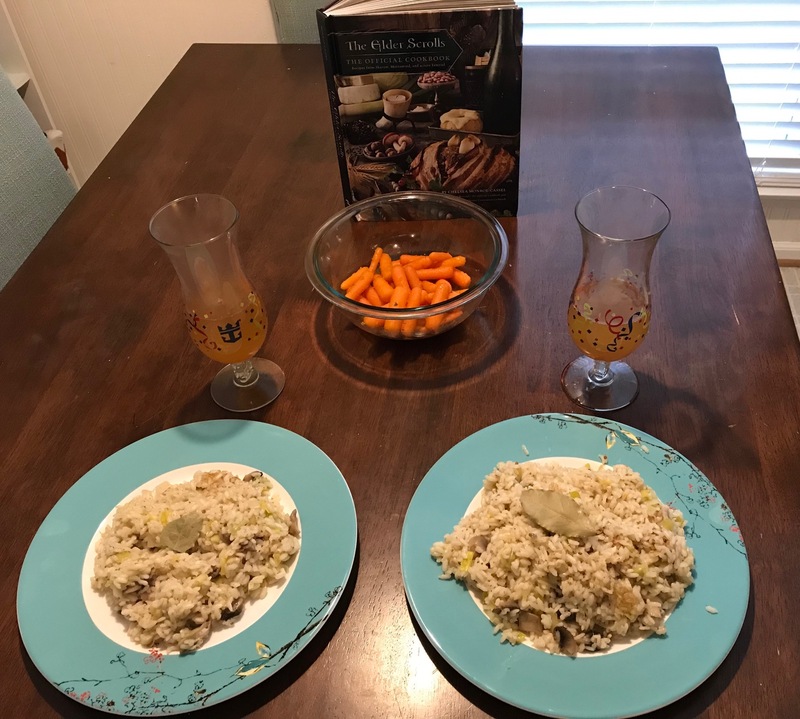 Naturally I needed to inject my own experiences into this review given how personal cooking is: what you're seeing in the picture above is the Baby Carrots in Moonsugar Glaze (read: zested orange and brown sugar marinade), Mushroom and Vegetable Risotto, and Imperial Mulled Wine recipes. The former was delicious and relatively easy to prepare, and the risotto recipe is one of the most intuitive I've seen to date: only improved by the healthy helping of leeks into the mix. The cinnamon-heavy Mulled Wine was very hearty and works nicely as a way to cap off a long winter season. Just like Monroe-Cassel's other works the instructions are easy to follow, thorough, and succinct. Having spent many sessions reading over recipes throughout my life those are great qualities to strive for: certain cooking subscription services could learn a lot from cookbook authors. Most recipes are contained on a single page, allowing you to easily prop teh book up while reading it. As for the future of the book when it comes to my cooking rotation, it's already made it in for repeat use. I plan on revisiting several recipes and trying out most of the book. Before you ask, yes, it also includes the infamous Skooma drink (which is mostly vodka, apricots and vanilla extract among a few other ingredients) and there's a little bit of pizzazz involved: like, "literally two to four weeks to infuse" level fanfare. It's infusing as we speak! 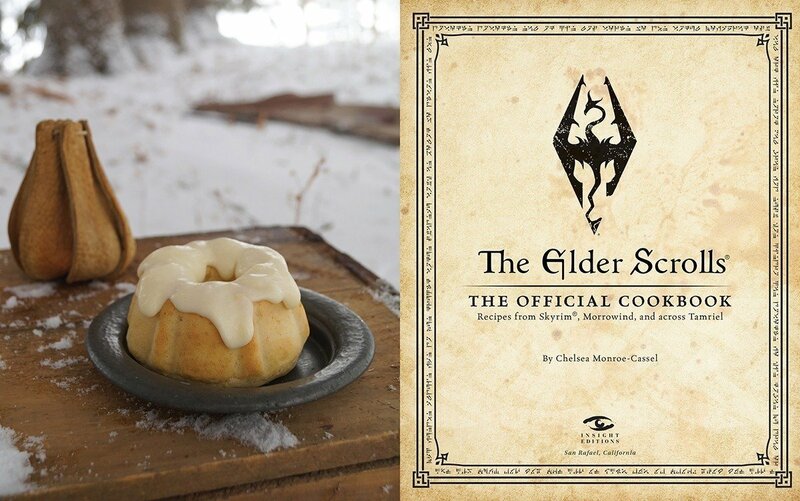 For obvious reasons you'll get a little more out of it if you partake in the series, but I can recommend The Elder Scrolls: The Official Cookbook regardless.